How about a short and sweet review for your Sunday? It’s really nice out today and I feel I should sit outside and enjoy it for a bit. I’ll admit I tend to be a little hermit-y on weekends. In fact, it’s 6pm right now and I’m still wearing my pajamas. Well! That’s what Sundays are for, pretty sure. Rest, relaxation, and periodically wearing pants. 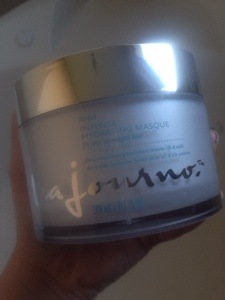 It’s a hair mask from Lea Journo. I was so excited to get this. I already have a hair mask that I honestly love (the Carol’s Daughter with monoi oil), but I’m always eager to try new stuff. Hence the hoarding mass I’ve collected and deposited in both our bathrooms. Just marking my territory. No big deal. I absolutely love Beauty DNA. This is an amazing subscription service. It cost $25 and you get one full size product. The profile you fill out is so detailed that there is no way in hell you’re getting something you don’t want. If you do, you filled out your profile wrong, and shame on you. They alternate categories each month so you’ll get either a hair, body or skincare product and then the cycle repeats. I’ve gotten two boxes – skin and hair – so next month will be body. And whatever they send, I know it will be my brand new favorite. But back to the Lea Journo hair mask. You can use this twice a week which is perfect because that’s how many times I wash my hair. Meant to be? I think so. In comparison to the Carol’s Daughter, it doesn’t smell as good but it still smells good. I used it on my hair tonight and it was very creamy. My hair feels very soft, and hopefully in the morning I won’t have to work as hard. Maybe I won’t have to do anything but a quick comb-through. Wouldn’t that be a dream? Unfortunately, I don’t have the proper texture of hair to not have to flatiron. Unless lumpy frizzy hair is the look I’m going for. I’m looking forward to what’s next up for Beauty DNA. I enjoy this box so much. I have a feeling after I end up canceling every box I subscribe to (hypothetical situation, of course) I will still keep Beauty DNA around. They are legit, people. You may go sign up now.